What are the possibilities and challenges of collaboration in the anthropocene? Justice in a More-Than-Human World is a series of events exploring various modes of humans working with nonhumans—animals, plants, ecosystems, and technologies. How can humans foster more collaborative (and less exploitative) projects with these nonhuman others? 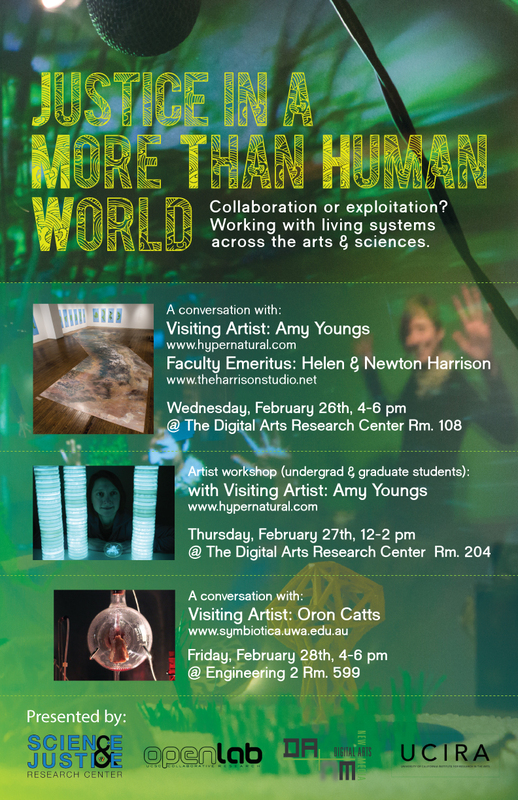 The series begins Wednesday, February 26th, 4-6 pm in the Digital Arts Research Center (DARC) Room 108 with a panel discussion on Human/Nonhuman Collaboration across the Arts & Sciences. This event features visiting artist Amy Youngs and UCSC Emeritus Faculty Helen & Newton Harrison. They will discuss the cross-pollination of art and scientific research in their work, with a focus on human/nonhuman collaboration in the worlds of eco art, bio art and interdisciplinary connections with the biological sciences. Amy Youngs will also host an Artist Workshop for undergraduate and graduate students on Thursday February 27th from noon to 2pm in DARC Room 206. Sponsors for the event include the UCSC Science and Justice Research Cluster; UCSC Digital Arts and New Media; UCSC Open Lab; and the UC Institute for Research in the Arts. This event series is free and open to the public.